INDIANAPOLIS, Feb. 10, 2014 – Three past Nastia Liukin Cup competitors are among the 12 gymnasts who qualified last weekend to the 36-athlete field for the 2014 Nastia Liukin Cup, scheduled for Feb. 28 in Greensboro, N.C. The Nastia Liukin Cup will be held the night before AT&T American Cup at the Greensboro Coliseum Complex. The qualifiers from this past weekend, along with the invitational where they qualified, are listed below. Stefani Catour of Phoenix/Desert Light Gymnastics, senior, and Lauren Ramirez of Chandler, Ariz./Gold Medal Gymnastics, junior; Fiesta Bowl Invitational, Chandler, Ariz.
Kennedi Edney of Chino, Calif./Precision Gymnastics, senior; Gliders Invitational, Ontario, Calif.
Maddie Karr of Stillwater, Minn./Twin City Twisters, and Olivia Karas of Chicago/IK Gymnastics, senior, and Courtney Klausen of Concord, Calif./Head Over Heels, junior; IGI Chicago Style, Chicago, Ill.
McKenna Kelley of Fairmont, W.Va./Stars Gymnastics, senior, and Alyona Shchennikova of Arvada, Colo./TIGAR, junior; Pikes Peak Cup, Colorado Springs, Colo.
Madison Brunette of Seattle/Seattle Gymnastics Academy, junior; Charity Choice Invitational, Tacoma, Wash.
At the Fiesta Bowl Invitational, Catour, who competed at the 2011 Nastia Liukin Cup, posted a 38.175 to grab a senior berth, while Ramirez earned her third straight appearance at the Cup with a 38.375 in the junior division. A participant in the Cup in 2012, Edney will make her second appearance at the Nastia Liukin Cup after winning the senior Level 10 competition at the Gliders Invitational with a 38.150 in the all-around. Three gymnasts advanced from the IGI Chicago Style competition with Karr, 38.300, and Karas, 38.175, going 1-2 in the senior session. Klausen posted a 37.225 in the all-around to earn a junior spot at the Nastia Liukin Cup. Kelley, daughter of 1984 Olympic all-around gold medalist Mary Lou Retton, advanced with a 38.225, while Shchennikova, the sister of U.S. Junior National Team member Polina, scored a 37.450 at the Pikes Peak Cup. Brunette punched her ticket to the Nastia Liukin Cup at the Charity Choice Invitational, earning a 37.575. Baker scored a 39.300 to win the Level 10 session at the WOGA Classic and earn a spot at the Nastia Liukin Cup. Juniors Rivers, 38.500, and Johnson, 38.000, also earned Cup spots in Frisco. 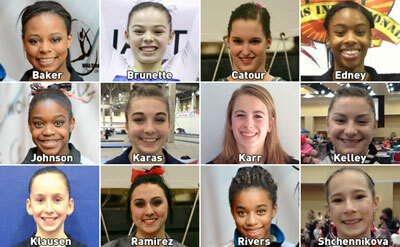 A total of 18 junior and 18 senior gymnasts will advance to the Nastia Liukin Cup. Senior athletes must be 16 years of age or older, and junior athletes must be 15 or younger. The invitational meets remaining in the 2014 Nastia Liukin Cup Series are listed below, and the numbers in parentheses indicate how many qualifiers are determined at each invitational. Gymnasts who compete in the Nastia Liukin Cup will receive a Nastia Liukin-designed leotard and a warm-up from GK Elite; two tickets to the AT&T American Cup and recognition during the event; and the opportunity to meet Liukin and participate in a team photo. Nastia Liukin. At the 2008 Olympic Games in Beijing, Liukin's total of five medals tied the U.S. gymnastics record for most medals in one Olympic Games, held by Mary Lou Retton (1984) and Shannon Miller (1992). Liukin's Olympic medals are: gold – all-around; silver – team, balance beam and uneven bars; and bronze – floor exercise. Liukin was the third of four U.S. women to win the Olympic all-around crown. She also won nine World medals in her career. Liukin has graced many magazine covers and appeared on various shows, including "Gossip Girl," "Make It or Break it," and the feature film, "Stick It." She was also chosen as one of 2009's most influential women by MSN Lifestyle. Liukin is now attending New York University in New York City, studying sports management. Last fall, she was a member of the creative team and a cast member for the Kellogg's Tour of Olympic Champions, a national, 40-city tour that followed the 2012 Olympic Games. Liukin was coached by her father, Valeri, who has four Olympic medals from 1988 including two gold. AT&T American Cup. The 2014 AT&T American Cup is one of the most prestigious international invitational events and features an all-around format. The list of former champions comprises some of the sport's best-known names, including Jordyn Wieber, Nastia Liukin, Jonathan Horton, Bart Conner, Paul Hamm, Shawn Johnson, Shannon Miller, Carly Patterson, Mary Lou Retton and Peter Vidmar. For more information, go to www.attamericancup.com.